$45.00 Fire retardant inner communications helmet worn with the GSh- 6A High Altitude Pressure Helmet, dated August 1979. 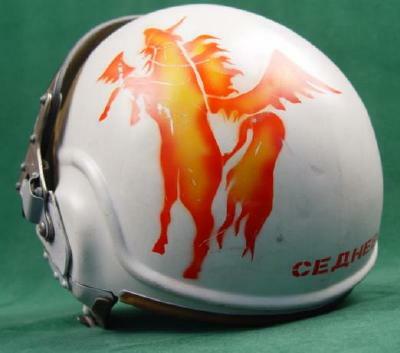 Introduced in 1962 for use inside the iconic white "bone dome" worn by MIG fight pilots. Size 3, equivalent of European 59 or US 7 3/8. In excellent condition. $39.00 KM-15 I Oxygen Mask, designed for emergency in-flight use on a multitude of Soviet aircraft. $50.00 Soviet Air Force jet pilot's Anti-G pants. Mint unissued condition, in original bag of issue with paper. Size 2. $640.00 NAZ-7 Mig Survival Kit, dated 1991, with winter issue folding snowshoes. Contained in parachute type bag, a sectionalized backpack of extensive survival gear. $550.00 NAZ-7 Mig Survival Kit, dated 1991. Contained in parachute type bag, a sectionalized backpack of extensive survival gear.